Joining a DG (Discipleship Group) in church is one of the best things we have ever done. We meet once a week for DG get-together night. It's basically a time for fellowship and reading/studying God's Word as a group and as a time to catch-up with how our week had been. It is through our DG that we have indeed found the gift of fellowship in a small group, and at the same time, having a small support group who you can share your life as you walk in Christ and who'd pray with and for you and celebrate with you with each life milestone. 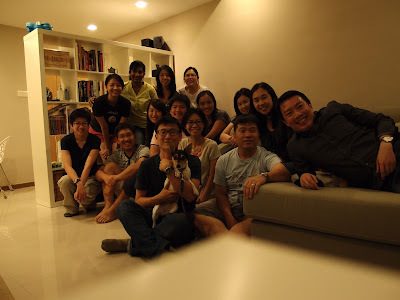 Over time, we had become more than just DG-mates but friends as well. Here's our group photo (and I think our only photo) before we called it a night.